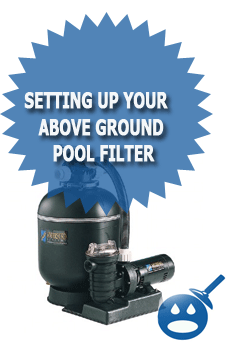 In order to properly hook up your above ground pool filter system you will first need to make sure you have everything to do so. You will need the pump, the filter which may be sand, D.E. or a cartridge, pool hoses to connect the pump, filter all to the pool or rigid PVC plumbing that will connect the pump and filter to the pool. You will also need a few tools as well to connect the pool hoses and to also connect the PVC plumbing unions that may be on both the pump and filter. You will need a screwdriver to tighten the hose clamps, a pair of channel locks to tighten the PVC plumbing unions and you may also need some Teflon tape to wrap around some of the plumbing fittings if they are loose or worn from the prior years use. You will also need a bucket so you can prime the pump and start it up after you are all done connecting it. You will also need a source of electrical power for your above ground filter system as well. Once you have gathered the tools, made sure that you have electrical power to the outlet near your filter system you then will want to take the filter and the pump over to the filter area where you will be setting the filter system up. 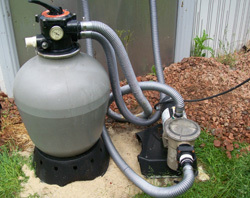 Some above ground filter systems have plastic bases that both the pump and the filter will sit on. You will want to make sure that you level the ground first before you place the plastic base down. This will ensure that the pump and the filter will sit level and the pump will run properly throughout the swimming pool season. If the plastic pump base is not level it could cause the pump to not run properly, so you will always want to spend a few minutes to make sure that the pump base is level. You can level the pump base easily with a flat shovel and a torpedo level. it should only take a few extra minutes but will help your pump run smoothly and last a lot longer. In the front of every pool pump is an opening which is called the suction side. This suction opening will usually have a fitting threaded inside of it called a male adapter or another type of fitting called a cone adapter. The male adapter will be connected to rigid PVC pipe and this is usually found on larger above ground pools or semi-above ground swimming pools. the cone adapter will hook up to the pool hose with a hose clamp. This type of adapter (cone) is most common on 80% of the above ground swimming pools set up today. To hook up the suction side of the pump with the cone adapter, you will want to slide a hose clamp over the end of the hose and then slide the hose onto the cone adapter. Once the hose is slide onto the cone adapter you will want to tighten down the hose clamp. Once one end of the suction hose is connected to the pump, you will now want to connect the other end to the bottom of the pool skimmer. On the bottom of the pool skimmer you will find a cone adapter that is built into the mold of the pool skimmer or it will be threaded in like the suction side of the pump. If your pool does not have cone adapters and has a male adapter and a PVC union fitting you will want to match the face of the union up with the collar of the union. But before you do so you will want to make sure that the o-ring inside of the union face is in good shape and is not flattened. If the union is flattened or possibly even missing the suction union will leak and this can cause your pump not to prime or even run correctly. Now that you are sure the o-ring is in good shape you can match the union face with the collar and then you will want to tighten the two parts together until the union collar ring is hand tight. You will now want to take your channel locks and will want to tighten the union about a 1/2 turn more to make sure it is fully tight. Do not over tighten the union because you can break it if you are not careful. Check under the skimmer to see of the pipe is connected or if you will have to hook up the union underneath the skimmer as well. If there is in fact a union under the skimmer you will want to check the o-ring and then tighten it down just like you did with the union on the suction side of the pump. Once you have connected the suction side of the pool pump, it will be time to connect the discharge side of the pump to the filter and then you will have to connect the filter discharge to the return fitting on the side of the pool wall. The first thing you will want to do is to connect the small hose to the top of the pump or side of the pump which is the discharge side of the pump. After you connected one side of the hose to the discharge side of the pump, you will now want to connect the other side of the hose to the multiport or directional valve on the top or side of your filter. You will want to look for the “pump in” spot on the filter. It is important to make sure that the discharge side of the pool pump is connected to the filter in on the filter. 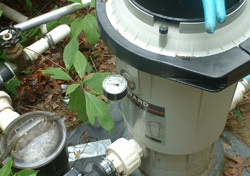 Now that the discharge side of the pump is connected to the filter, you will need to connect the filter to the return fitting on the side of your pool. you will want to look on the multiport for the “to pool” or “out from filter” and connect one side of the hose to that and then connect the other side of the hose to the return fitting on the outside of the swimming pool wall. If your pool filter is located inside of the skimmer then you can skip this step and just connect the hose from the discharge side of the pump to the return fitting on the side of the pool. If your pool return is also a light you will want to connect the discharge pool hose to the fitting that is on the back of the light. The AQUA LUMINATOR swimming pool light is also a return fitting as well as a light. So if you have this pool light, you would take the pool hose and hook it to the fitting that is on the backside of the pool light. you do not have to worry about hooking the pool hose up to the return fitting on the wall because the light acts as both the return fitting and the pool light. On rare occasions on large oval sized above ground pools you may see more then one return and you may need to add an additional hose to send water to that return from the discharge on the pump. Once you have connected the suction side and the return side of the pool pump you will want to make sure that the pump housing is full of water. You can do this one of two different ways. If your winter skimmer plate is not off of the skimmer yet, or the pool water is not as high as the skimmer opening you can open the pump housing by removing the pump housing cover and then you will want to fill the housing up with water using your bucket or garden hose. Once you have filled the pump housing up with water you will want to pour a bucket full of water into the skimmer to make sure that the suction hose is also full of water. Then you will want to fill up the pool until the water level is at the mid-skimmer level. Once the water level in the pool is mid-skimmer and the pump is primed you can start the filter system. Now if your water level is already mid skimmer and you need to prime the pump you may think that just the water from the skimmer going into the pump will be enough to prime the skimmer but that is not true. What can happen is that you can get an air pocket inside of the hoses and this will cause something called a hydro-lock. So before that happens you will want to just open the pump housing cover a tiny bit and you will see a whole bunch of air and water spit out from the pump lid. Hold the pump lid open for around 5 seconds or so and then close it back up. This will allow the air to escape from the pool suction line when you turn the pump on it should start right up. If you have any questions about hooking up your above ground filter system, you can leave a comment below and I will try to answer your question for you as best as I can. When and how long do you leave the filter on and when do you turn it off? I have an above ground pool 12’3′. Run your filter around 4 – 6 hours a day when the sun is out. Run the filter 7 days a week, and if you have a timer, just set it to do so. Make sure to also keep your chlorine and other chemical levels in the proper range. Let me know if you need any additional help, if not enjoy your summer. 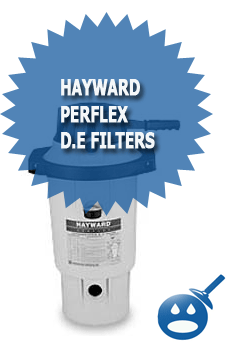 I have a Hayward filter but do not know how to set it up. It has been dismantled. I need to add the sand and set it up but am not sure how to proceed. I can help you, could you tell me what type of pump and filter you have? Also check out these videos of pool system installations from real pool job sites, These videos might do the trick for you. I have an above ground Hayward DE filteration system (EC40). As of lately, I can’t keep water in the strainer pot. When I open the pot covering it immediately fills up with water, but within 30-40 minutes, all the water disappears (which I know is really, really horrible). I’m not sure how to correct this or what to do. The tube that leads from the pool skimmer appears to be clear and is properly connected. I don’t understand why water will not freely enter the pot. Please help me. Thanks! Joseph: I have a question on a new install. 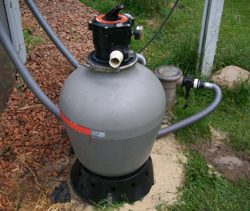 We have Hayward 1/2 hp superpump and Hayward 22′ sand filter, a wide mouth skimmer and nothing to connect all this together because we didn’t buy a pool kit. We went modular with the equipment because we wanted a big filter. So is there a picture or schematic of all these things connected together with specs so I know what hoses and connectors to buy? I think we want to site this on an area that is about 5′ below the bottom of the pool level. Will that be a problem? The proposed equipment site is about 12′ max from the skimmer, but 5′ lower than the pool bottom, so about 7′ below the skimmer basket. What hoses/connectors/clamps do I need? I think I need four cone adapters and two or three hoses, but what sizes? It appears all the openings have interior threads and are 1 3/4″ interior. Can you help. We thought we could we do this ourselves but we are into this thing for many dollars and many more weeks and all we have is a bunch of really nice expensive equipment and no expertise. bought a brand new filter and its doing the same thing i cant figure out whats wrong can you help me. I just had a semi inground pool installed, I waited the appropriate amount of time to make sure the liner did not leak, past two days I backfilled. Today, I installed the filter and pump (both hayward). When I turn on the pump, it does not draw water from the pool and the hose going to the filter from the pump flattens out. I removed the cover from the pump several times to prime the pump and water enters the pump with no problem. I previoulsy had above ground pools with no problems hooking up the pump and filter. Is there something else required for semi – ingrounds? I have a Jaquzzi DE filter and I bought a new Hayward 1 HP pump. How to I connect them when the filter is set up for a vertical connection and the new pump has a the connection on the top of the pump and not the side??? Both are threaded. Are there connection kits available??? Thank you. Me again..I forgot to tell you that the connection to the filter is on the bottom half. I realize it would be much easier if it was on the top but that is just how my life seems to go. Thanks again. The increaser on the discharge side of the pump is designed to increase the pipe diameter from the pump nozzle to reduce the velocity of the liquid in the discharge line in order to reduce the total head the pump is required to develop to operate the system. blog? My blog is in the very same niche as yours and my visitors would definitely benefit from a lot of the information you provide here.